Within the rituals of occultic orders, such as our Order ( Freemasonry ), it is required that the candidate circle the altar of the lodge in a particular manner. It is called circumambulation. Circumambulation is the practice of "...making a circuit about a thing or in an area of reverence..." In Masonry, circumambulation involves the making of a circuit around the Lodge, while keeping the right hand toward the altar. "During the circuits of the lodge room, corners should be squared in accordance with the ancient tradition of 'squaring the lodge'". Further, the Entered Apprentice during initiation shall proceed to the northeast corner of the Lodge three times during the circumambulation, the Fellowcraft during passing shall proceed there four times, and the Master being raised shall proceed there five times. The 47th Proposition of Euclid is known as "that amazing Proposition which is the foundation of all Masonry." It is also known as the Pythagorean Theorem. The Pythagorean Theorem is important in building, and one of its uses is to square a room. Builders use the theorem to square the corners of rooms by using the ratio of the numbers three, four and five. three squared plus four squared = five squared. 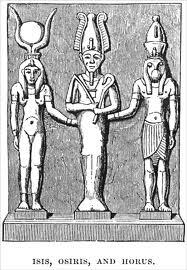 This was, with the Egyptians several thousand years ago, the standard and symbol of perfection ; and they made it also the basis of all their measurements ; they looked on it as the symbol of Universal Nature, the side "4" being "Osiris" the male principle, "3" the female principle "Isis", and "5" "Horus the son", the product of these two principles;---they said 3 was the first perfect odd number, that 4 was the square of 2 the first even number, and 5 was the result of 3 and 2. Any Mason, after having been raised, has reproduced by circumambulation the numbers three, four and five in the most significant corner of the Lodge, the Northeast, and thereby has unknowingly recited with his feet the formula which is contained in the 47th problem, and thereby has "squared the Lodge".